The business end of the season has come early around the Green Elephants Stadium. With 12 Bostik Premier League matches to come Ian Chapman, his management team, players, officials and fans need to find a winning formula and fast ! In other circumstances a Mid week reversal at Needham Market Fc (12 miles north of Ipswich) wouldn't been seen as a problem but when you are propping up the table it hurts and hurts real bad. A 10 hour round trip is tough to take on the back of a three one loss. The team coach left HQ at 2pm travelling up the M23, around the M25, up the A12 and eventually into the pretty market town of Needham for 5pm. After several liveners in town around a dozen fans made their way to Bloomfields for a 7.45pm kick off. Needham are a wonderful club with a fantastic home facility which they are improving all the time. A 4G training pitch is currently being constructed. After a positive training session last Saturday the Hillians came out on the front foot. Lee Harding as right back was having a very influential effect on the play. Passes were crisp and accurate. For most of the 1st half it was the visitors who looked mostly likely to score. Lucas Rodriguez was having a fine game operating down the right side. It all looked promising. However Needham took the lead on 34. A cruel but predictable ricochet in the Hillians box left Gareth Heath a virtual tap in. Chips are down at the moment. Early in the 2nd half Rodriguez got on the end of the long cross at the back stick and his racking half volley was some how clawed away by veteran Needham keeper Day. That was the turning point as the hosts Samuel Nunn scored a crushing 2nd. Two soon became three before Lucas scored a consolation right on time. There were a lot of bowed heads as Hill trooped off but not before coming over the away support. There were some pained expressions in the club house after especially from assistant manager Stuart Tuck who seemed to be taking it very badly. After what seemed an eternity in driving rain we were back in Mid Sussex for 2am. I am not having it that BHTFC are getting relegated this season. 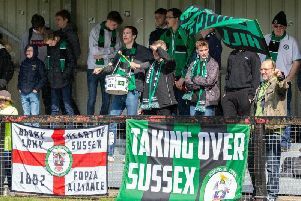 With no disrespect to Bostik South a drop through the trap door come 28th April would put the Hillians and Mid Sussex football back into the dark ages. As a group and that means every single one of us we need to start running through brick walls.